AWP Rental Market size was valued at over USD 15 billion in 2016 and will grow at over 4% CAGR from 2017 to 2024. Increasing utilization of access platforms in infrastructure projects across the globe is anticipated to drive the AWP rental market growth. Rising investments made by various regional government in the construction sector such as building airports, residential & non-residential infrastructures, stadiums is providing ample opportunities to the industry. Due to the level of safety offered by access platforms as compared to scaffolding solutions, government across various regions are encouraging and supporting the use of these equipment. Access equipment are increasingly utilized in factories & manufacturing plants for material handling applications as well as in telecommunication sector for maintenance & installation of telecom poles, overhead lines. The introduction of the concept of rental platforms in emerging economies such as China and India coupled with the presence of number of rental equipment operators, contribute to the access platform rental market growth. The rental industry in Asia Pacific is very young, with huge potential to grow over the forecast timeline. Factors such as increasing regional government focus on safety & productivity, rising demand for modern equipment and work practices in major infrastructure projects further contributes to the mobile elevated work platform (MEWP) rental market growth. Various factors posing direct challenge to the rental companies include controlling functional tasks and complex business operations such as equipment lifecycle management and scheduling work orders & maintenance. Managing inventory & financials, optimizing the utilization of fleet and anticipating the equipment maintenance & repair activities are among other challenges in the access platform rental market growth. Indirect challenges include lack of awareness associated with the use of these equipment followed by scarcity of trained equipment operators, negatively impacting the mobile elevated work platform (MEWP) rental market. The demand for renting scissor lifts is on the rise and is rapidly gaining popularity in the emerging economies owing to the high level of safety offered by these equipment as compared to traditional counterparts such as ladders. Scissor lifts feature crisscrossing braces that extend vertically upward and are most commonly used in industrial, manufacturing and construction sites. Large platform offered by scissor lifts coupled with the increasing demand from projects with low budget are major factors leading to an increase in the demand for these equipment’. For jobs that require multiple workers to work at elevated heights, scissor lifts facilitate ease of operation with its large platform and precise operation, contributing to the AWP rental market growth. Construction applications accounted for majority of the market share in the AWP rental market. Increasing utilization of access equipment in construction sector for working in elevated heights as well as maintenance & repair activities will propel the industry demand over the forecast timespan. Economic growth across the emerging economies such as China, India coupled with constant demand for industrial, infrastructural & residential expansion has generated the necessity for new construction projects. Furthermore, smart city initiatives by government across various regions offers ample opportunities to the industry demand. In order to reduce overall project costs, companies across the globe prefer to rent these equipment’. Renting in mobile elevated work platform (MEWP) rental market are considered a profitable approach to end-users since it helps in reducing the maintenance costs and other expenses associated with transportation and operations. Renting provides a cost-efficient solution for companies or projects that require these access platforms for a short duration of time. China mobile elevated work platform (MEWP) rental market is predicted to grow over the forecast timespan. It can be attributed to rising awareness associated with access platforms followed by the rapidly increasing regional as well as international rental operators. The equipment rental industry in China is relatively new and currently the industry’s major focus is on renting scissor and boom lifts. Companies in the Chinese access platform rental market utilizes their resources to expand in a given market area by increasing regional presence, a similar business model to mature regions including the U.S. and Europe. As the wage rates in China are increasing by 10 to 15 percent every year coupled with changing other consumption patterns, customers tend to rent this equipment, which is driving the demand. Increasing number of infrastructure related projects across many regions such as Asia Pacific and MEA with tight timelines will generate significant demand opportunities for the mobile elevated work platform (MEWP) rental market. Contractors are increasingly focusing on replacing scaffolding with considerably more safer access platforms and adoption is expected to rise over the years. Furthermore, the high cost associated with the purchase of these equipment is compelling various sectors such as construction, government, telecommunication to rent access equipment for general repair & maintenance activities at hard to reach heights. 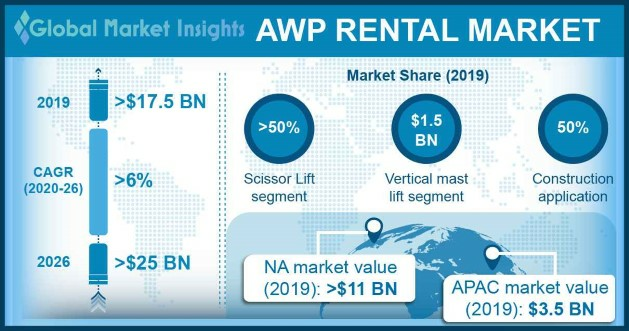 Companies in the AWP rental market include United Rentals, Ashtead Group, Loxam, Herc Holdings Inc., Aktio Corporation, Blueline Rentals, Haulotte Group, Kilotou, Riwal, AFI Uplift Ltd., Nesco Rentals and Sunstate Equipment Company. The access platform rental market is highly fragmented and competitive in nature owing to the presence of various industry participants, who are providing technologically advanced equipment to sustain in the industry. Furthermore, the rental operators are heavily investing on cleaner and new access platforms in order to increase the fleet size and to ensure that there is no shortage of modern equipment. 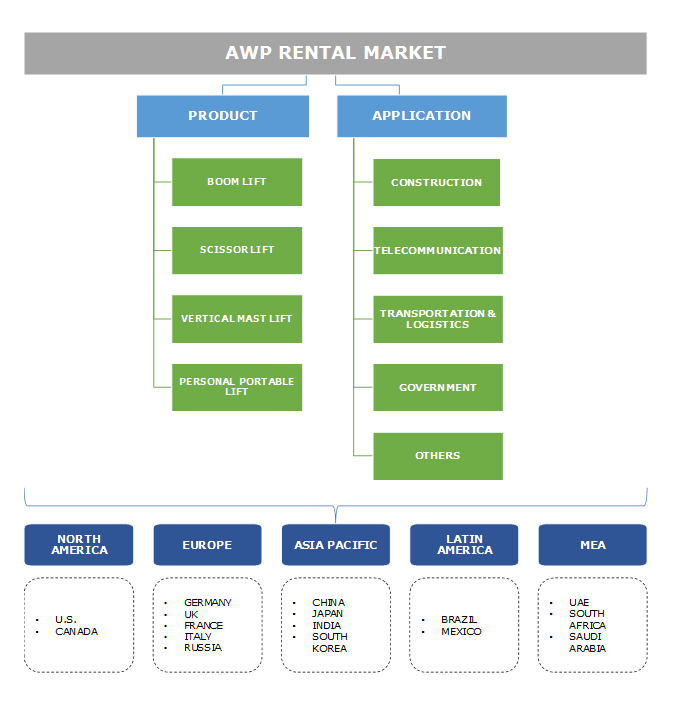 The AWP rental market is characterized by intense competition among the industry players. Huge number of small and large companies are operating on regional as well as international levels. Large companies operating in the access platform rental market have significant purchasing power and are capable of offering customers with a wide range of equipment and services in order to meet demand. However, most of the small players operate off the books for cash transactions, offering lower rates and avoid paying taxes. Surge in demand from the construction and industrial sectors is enabling the operators to continuously enhance the fleet and improve the rental rates.